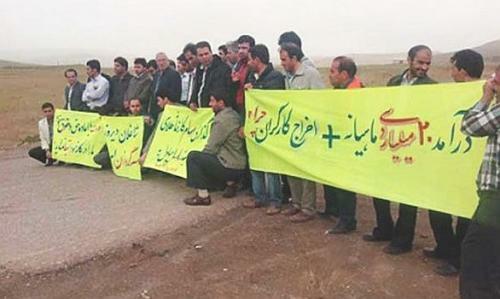 The Pooya Zargan company which operates the Aghdarreh gold mine, (it is said that most of the shareholders of this company are members of the Revolutionary Guard) filed a case against 17 of the workers, who were summoned to court in Tekab city in West Azerbaijan province. The allegations consisted of "preventing people from doing business by disturbing the peace", "insulting the mine’s security guard", "destruction of a guard’s clothing and illegally detaining him" and "deliberate destruction of the mine’s signboard", respectively. According to their lawyer, Vahid Yarifor, the workers were sentenced to between 30 and 100 lashes and fined 164 dollars, based on two separate court rulings, and these were all implemented in the last days of May. Carcinogenic sheep's milk, contaminated water, there is not much to do in here. Many are unemployed. There is not even a job where we can just make ends meet. There is no land left to plough nor water or grazing left for farming (3). Now, rumbling protests have started against this barbaric act. Users of social media have shown a lot of sympathy towards the workers. As always, different factions of the government have hypocritically identified themselves with this by way of resignations from this governor or that manager. With their usual shabby tactics, Reformists and Moderates are mainly blaming the hard-liners’ faction for putting obstacles in the way of The Joint Comprehensive Plan of Action (JCPOA), the recent agreement between the West and Iran. What a bitter story! Those who assumed power in 1979 in order to build a paradise in this world under the shadow of the divine commandments, with promises of “free electricity and water” and “bringing the oil money onto the table”, now that they have won power and authority purely by benefiting from workers’ labour, with absolute obscenity and brutality and in the full light of day, refer to the same divine commandments, not only to impose lay-offs and fines, but to flog workers just for protesting against losing their jobs. The banner held up by the workers says £4 million a month in profit and they are sacking workers. Why? Work resembles the manifestation of God Almighty which permeates all creatures. God Almighty is the origin of labour and is a worker. There is work in all creatures and they were made through work. All particles of existence are workers, even the particles of an atom which exist in the world of nature are workers and with awareness, all particles of the universe are active but we assume they are not aware (4). 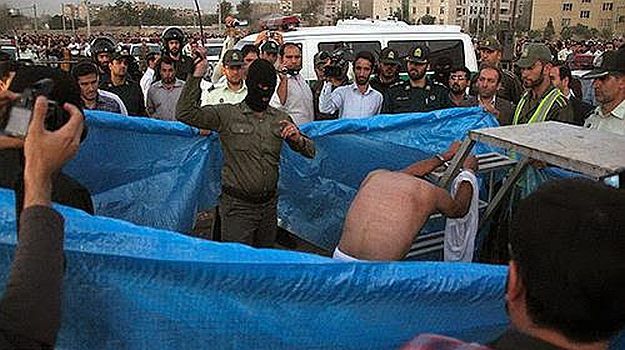 Of course this is not the first time that the capitalist Islamic regime's floggings have fallen on workers and without a doubt it will not be the last one, but all these are now taking place when day in day out, we have to put up with deafening propaganda about the victory of "moderation" and "prudence" against "extremism" and "terrorism" from the regime, its international allies, reformists and newly-become democrats of ex-lefties ... Of course, for these gentlemen, capital's servants, flogging someone for simply protesting against losing their job, probably is not extremism or terrorism. Ever since the days when these gentlemen were asking workers to rush to the front to defend the motherland, to Rafsanjani's post-war reconstruction era when workers were told to say nothing but work hard, to Khatami's reformist era when workers were told to listen to his nonsense of Dialogue Among Civilisations and just wait for Ahmadinejad, the era of demagogy when, despite the biggest oil income in Iranian history, workers’ share was unpaid wages, and right up to today ­– with the promise of doors being opened by the so-called "moderation" and "prudence" keys of president Rohani, ... what has not changed and will not change so long as capital rules is the exploitation, torture, and floggings of workers. No kind of appeals to so-called legal and international institutions, no kind of literature, poetry, drama, or fervent speeches ... will plaster over the scars of flogging. The day they called God a worker was simply because the spectre of an uprising of the workers and toilers had cast a shadow over their heads. They have had experience of how workers’ power brought down the Shah's regime, they vividly witnessed workers’ determination and power on the streets. Now they are able to clamp down on any protest with such brutality solely because, by using religion with nationalism, they have managed to divide us into Sunni and Shia, into Persians, Arabs, Turks .... By thousands of means of deception they have managed to convince us to take part in the electoral farce and penetrate our ranks. They have been able to channel our demands into reformism. They have created a governmental safety valve for themselves in the shape of reformists and moderates ... just to create confusion for us. The only real response to the brutality of the regime of capital, is to once again raise the flag of class struggle. This is not just an ideal aim, it is the only practical option open to the working class, the rest is just illusion. The formation of new political vanguards who are starting to settle accounts with the counter-revolutionary role of the reformist organisations and in the process expose the limitations of demand struggles is the first priority and the immediate step towards ending these kind of acts of barbarism .... the day when the “God” of capital will be flogged by the workers. No kind of appeals to so-called legal and international institutions, no kind of literature, poetry, drama, or fervent speeches ... will plaster over the scars of flogging. The day they called God a worker was simply because the spectre of an uprising of the workers and toilers had cast a shadow over their heads. They have had experience of how workers’ power brought down the Shah's regime, they vividly witnessed workers’ determination and power on the streets. Now they are able to clamp down on any protest with such brutality solely because, by using religion with nationalism, they have managed to divide us into Sunni and Shia, into Persians, Arabs, Turks .... By thousands of means of deception they have managed to convince us to take part in the electoral farce and penetrate our ranks. They have been able to channel our demands into reformism. They have created a governmental safety valve for themselves in the shape of reformists and moderates ... just to create confusion for us." How clever of the bourgeoisie to call God "a worker"! But then the bourgeoisie are always clever when it comes to protecting their own interests, though their cleverness is limited to the techniques we call lying and deceit, followed up by brutality, torture and war. There is nothing the bourgeoisie will not stoop too in the preservation of their cruel and selfish dictatorships. Iran is no exception here. Though public floggings are rather a speciality. However, even these demonstrate finally the very traditional backwardness of the ruling regime there. "Traditional" because hiding behind religion, which provides a cloak for the hidden dagger. In this Iran and arch enemy Saudi Arabia are as much identical twins as implacable enemies. But the "electoral farce" referred to by Damoon, the bourgeois hue and cry about "democracy" isn't just to be found in Iran, but has become a major plank in the rule of capital the world over. Notice the current farcical and phony 'democratic' antics of the Presidential election in the USA, or the absurdity of the Brexit palaver in the UK. The increasing pointlessness and vacuity of bourgeois democracy becomes more difficult for them to hide. Because finally, and after all, the Caliph like the Emperor, and the Presidents and Prime Ministers, has no clothes. He's just a whip bearing sadist disguised hopelessly as a moderate and lying reformer, and hoping to get away with it.